For Iris and Dirck Hornung, Ambit is part of a busy family life. Together they have two kids, Stephan and Aurora, and they’ve included them every step of the way. From the decision to start an Ambit Energy business, to drawing vision boards, to building the business and the local Business Presentations they sponsor, they’ve worked as a family. Both Iris and Dirck come from humble origins in Venezuela. Each knew at a very young age that they had to do their best to be successful in life. While in Venezuela, they had successful careers in the Oil & Gas industry. However, when the government took over, they were practically forced to leave their country. They had already been looking for an opportunity to make additional income, but this life-changing experience opened their eyes to other possibilities. In the US, they had rental properties, and were investors in other traditional businesses by the time they were shown the Ambit Opportunity. Dirck was invited to see a business presentation by a longtime friend on a Friday in May 2015. “I saw several friends losing their jobs. People with 10, 15, or 20 years of experience with incredible resumes with no plan B in place” Dirck says. He did not have any previous experience with MLM but after consulting with Iris they decided to pursue the Opportunity. Iris had some experience and success with MLM in Venezuela, where she was able to make enough money to buy the furniture for her first apartment and create some savings at an early age. “We knew it would be challenging to grow an organization in the US. We did not grow up or go to school here, so our network was limited, but we would not let that stop us from reaching our goals” says Iris. “This is our American Dream,” they say. The Hornungs want to encourage others to embrace the same opportunity and learn how it works. 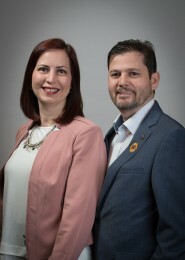 Their main goals with their Ambit Energy business are to retire early to have more time to travel, to create a legacy for their kids, and to inspire others to dream big and achieve their goals. We want to build a legacy for our family, be an inspiration for our children and our team members, so they feel proud for thinking outside the box and for deciding to work for their dreams. Every single chance we get. We are truly focused in building our Ambit business. Home Parties have proved to be our most successful tool. Also, we attend a minimum of two Business Presentations a week and always try to have guests present. Local trainings, as well as AMBITION and SIMULCAST have also helped us greatly. We follow the leaders and learn from them, especially NCs Chris and Debbie Atkinson, and ECs Ralph and Ann Nicosia, whom we consider mentors and are an inspiration to us. Mingling with other Ambit Consultants, learning from the leaders and getting re-energized for the year. Thanks to the five SCs who helped me/us reach EC.